The Merge statement in SQL Server 2008 can be used to perform multiple inserts, update and delete operations. Assume for example, in your organization you have a Source Table and a destination table. Everyday at the end of the business, data from the Source table is appended to the Target table. With SQL 2000/SQL 2005, the only way of doing this optimally (assuming that the tables are very large) was to find the Delta of all the changes in the source table and then update the same in the target table. The problem was that you would have to write your own logic or use other SQL Features like SSIS or CDC for finding the delta and then updating the target table. With the Merge statement you can do the same without much hassles. We can also use the Merge statement in an SSIS package or a job to automate the entire sequence. Syntax for the MERGE statement is simple to understand. First we have the Target table specified by the INTO clause, followed by the Source Table specified with the USING clause. Then we have the Join parameters. The join parameters are important, because this is what will govern which records are to be inserted or deleted or updated in the target table. Then we have the WHEN clause to define the criteria for INSERT, UPDATE and DELETE. For example, assume that your organization maintains 2 tables, one for daily purchases and another for Reporting which has the last purchase date and the total amount of purchases made by each customer. — the last purchase date and the total amount of purchased goods. 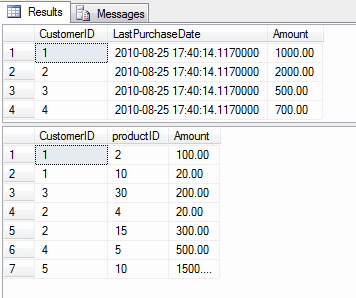 Notice the changes in the LastPurchaseDate and the Amount columns for the customer (1,2,3,4) and a new record with CustomerID 5 being inserted into the table.